Finally! After three years, a new "blessed" GPU for the Mac Pro running OS X: the Sapphire Radeon HD 7950 Mac Edition. I'm sure it has piqued the curiosity of every Mac Pro owner wishing for a faster GPU. So how fast is it? Let's get right to the test results. All Mac Pro GPUs above were in a in a 'Mid 2010' Mac Pro 3.33GHz Hex-Core. The two iMac GPUs (the GTX 675MX and 680MX) were embedded in the 'Late 2012' (27") iMac 3.4GHz Core i7. All Macs were running OS X 10.8.3. The AMD GPUs required a patch to run Heaven and Valley. AMD compatible versions of those apps will soon be available to all users. Blackmagic Design's DaVinci Resolve 9 adds speed and power to color grading of HD video. It uses the GPU to apply and playback effects in real time -- no rendering required. However, the more effect nodes created, the slower the playback. 1. With one exception (Motion), the Radeon HD 7950 is a significant improvement over the two GPUs Apple offers currently as factory options for the Mac Pro (Radeon HD 5770 and 5870). 2. The Radeon HD 7950 is clear winner over the current optional Quadro 4000 for Mac kit sold on the Apple Store. It also handily beats the GeForce GTX 285 -- a card once offered in a kit but no longer in production. Many Mac Pro owners likely still have it installed. If you have a Mac Pro running a Radeon HD 5770, Radeon HD 4870, GeForce GTX 285, Quadro 4000, GeForce GT120, GeForce 8800 GT, the new Sapphire Radeon HD 7950 would make a very strong upgrade. The only exception to this advice would be if you are running pro apps whose only GPU acceleration relies on CUDA support. One recent example is Octane Render. In that case, you must hope for a newer, faster NVIDIA CUDA 'aware' GPU that is OS X compatible. NEWS FLASH: EVGA will be selling a Mac Edition of the GeForce GTX 680. We will be testing it and adding those results to this page. CORRECTION: The Radeon HD 7950 is compatible with all existing Mac Pros from 2008 - 2012 (though Sapphire is officially specifying 2010 and after). It can run under Lion 10.7.5 and Mt. Lion 10.8.2 by installing special driver that comes on a disc. No special driver needed for 10.8.3. AND THAT'S NOT ALL. Check out "Part Duex" with results for seven more apps and "Shootout with the Sharks" where the 7950 goes up against 'extreme' GPUs -- flashed and unflashed. 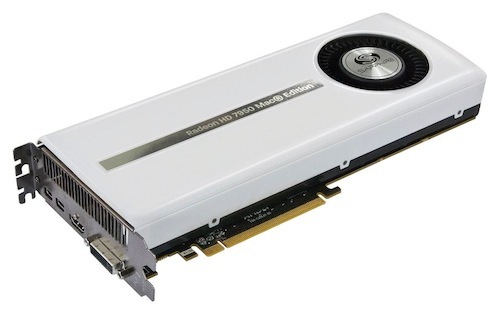 WHERE TO BUY THE SAPPHIRE RADEON HD 7950 for the Mac Pros running OS X. The price will be $479 (unless a reseller decides to offer it at discount). That's more than Apple charges for the Radeon HD 5870 kit (selling for $449). Hmmm. Well at least it is cheaper than the Quadro 4000 for Mac ($1200) which it easily beats. You can buy the Radeon HD 7950 Mac Edition from Other World Computing. Also check on Amazon, NewEgg, and TigerDirect. Search for "SAPPHIRE Radeon HD 7950 Mac Edition."